The National Fire Protection Association’s “NFPA 10,” “Standard for Portable Fire Extinguishers” specifies minimum requirements that must be met for a fire extinguisher to be considered safe. The requirements in NFPA 10 require the force of law in states by virtue of adoption or reference in states statutes, regulations, or through references in building and fire codes that are the law in those states. MONTHLY INSPECTIONS should be performed by the end user to ensure the equipment is at the highest safety standard. The extinguisher should be checked to see that it is not damaged, the discharge outlet (hose) is not blocked, that it is fully charged (gauge reading), the seal is not broken and that the operating instructions are clearly visible. ANNUAL CERTIFICATION is a more complete inspection of the extinguisher and should be done professionally. It will reveal the need for hydro testing which must be done on Dry Chemical and Halotron I extinguishers every TWELVE YEARS. Most local authorities require special tags be attached to the extinguisher to verify this service. SIX YEAR MAINTENANCE – Every six years, extinguishers shall be emptied and subject to thorough examination of: mechanical parts, extinguishing agent and expelling means. When applicable maintenance procedures are done during periodic recharging or hydro testing, the six-year requirement will begin from that date. TWELVE YEAR HYDRO-STATIC TESTING shall be performed on the cylinder showing that the extinguisher is still within factory standards. The cylinder is pressurized and expanded to the specifications set forth by the particular manufacturer of the unit. RECHARGE should be done immediately after any discharge by your service provider who has the trained personnel, extinguishing agents and equipment to do it properly. This extinguisher must be recharged with the extinguishing agent specified on the nameplate. 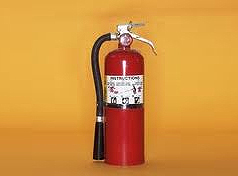 Substitutions could effect the UL listing of the extinguisher.